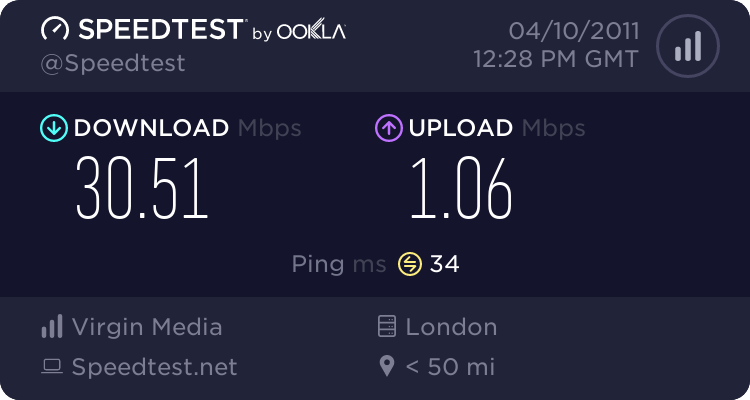 I recently changed from old copper cable based broadband provided by Zen Internet to fibre optic provided by Virgin Media, and I must say I am wowed by it's performance. See above. I am paying for 30mbps and I am getting 30mbps!! fancy that, actually getting what you pay for. Previously I was paying £25 per month for 8mbps over copper lines but actually only getting (if I was lucky) 1 mbps. Now I am paying £21.49 for 6 months then £30.74 and that includes the phone line. It still amazes me how broadband service company's can charge you a certain fee for a service you have no way of getting. Imagine if this logic was used in all industries, like the motoring industry. You take your car in to have the tyres replaced, but the garage charges you for a full service instead!! madness!